I want to tell you about my balcony garden. Here is a not so great picture of some it at the end of Spring or so of this year. What I love about my garden is that for every part of it, I have a somewhat mundane (but interesting to me) story about how it got there and its...life. I think it was at work and my senior editor, Darren Fleet, was really getting into gardening and also my old art director, Will Brown really got into gardening as well and their enthusiasm just rubbed off onto me. I've always wanted to feel some sort of self sufficiency with food (although this is kind of laughable after having this garden) and I got these really romantic notions of growing your own stuff and maintaining a garden in a city. Darren helped me make some of the pallet planters last summer. We went around his neighborhood and scoped out the pallets, he told me what to look for (which haha, I can't quite remember right now, but I think I'd know a good pallet when I'd see it thanks to him) and then we (or rather him) carried them back to his place and we (mostly him) built the planters. It was also the day where I first learned how to remove a nail from a pallet, and man, it is one of the most satisfying things ever. I decided I would grow "easy" things - radishes, broad beans, garlic, spinach. My apartment is facing north east and doesn't really get a lot of direct sun, and these things seemed like my best bets. This is a radish. When I saw it, I was like, oh man, radishes do this? I also thought that my radish was just a super radish and that it really loved my soil and just went crazy. Then I ate it and as like, man this is tough and kinda prickly. And then I found out later that this is...bolting and that the radish was probably in the process of dying. These are broad beans. When these popped up, I was like, man nature, have I got you figured out. When I planted these, I honestly thought I wouldn't get anything from the seed, I just didn't think there was enough sun or nutrients. I was also thinking, what are people talking about when they say gardening is so hard? Because all I did was just plant the seeds, watered them, and watched them and they just grew. But then I opened these up - AND THERE WAS NOTHING INSIDE OF THEM! I couldn't help but think then that my garden was a metaphor for my personality. Garlic scapes. By this point I was getting pretty lazy with my garden (for a couple of weeks there I was obsessed, I would think of other things that I could grow and would go to the garden center once every week on their discount days and buy a bag of soil and seeds and haul it back on a bus). I didn't pick these at the right time. They shouldn't be this straight. They were kind of tough and I refused to just throw out the tough parts when making a pesto with it and then still wouldn't take the tough parts out even when my blender couldn't chop them up. Also they were insaneeeeeellllly garlicky. It burned my body to eat just a tablespoon of pesto with this stuff. I was telling people that I felt overly healthy when I ate these garlic scapes, it's like they burned everything possible and I felt almost drained and dehydrated. I also had really garlicky breath that I was super self-conscious of. Sorry to everyone who had to hang out with me that week. I'm amazed that this grew. My boss gave me this sunflower seedling. I was really surprised that he did that and my mind went crazy with why. Of course I thought it was incredibly nice, but it's also something that was completely random for him to give me. He told me that it's a beautiful plant to watch grow. A true life cycle. I began to notice on the leaves that there were these little larvae with brown shells encased in the leaf. At first I was disgusted (I also felt this way when I discovered aphids on some of my plants or a bug in general), but then I got fascinated by them. I tried to help the plant by removing all the ones I could see (which I did almost everyday for weeks - I liked doing it because it's being really nit picky and forces me to focus and calms me down), but the stuff just kept coming back. And you could actually see the pathways that the worm things took on the leaf and you could just see the disease spreading. When I first saw this I was like, is that me? 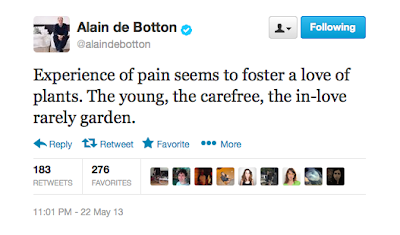 It kinda bummed me out, because gardening then just seemed like for sad old lonely people. But now I don't really think so anymore. Sometimes I found my garden to stress me out more then I'd like - I'd be afraid to deal with it for fear of what I'd find (a billion bugs I've never seen before, rotting plants, problems to deal with, etc) and plants would just start dying and flopping all over the place and look terrible- but every time I would finally just go in and clean it up, it wasn't nearly as bad as I thought it would be and I would always feel kinda nice after. Real healing. And I'm just constantly amazed that something grew. And yep, I think that this is all a metaphor as well.